I came to phx as a kid in 1959. at that time downtown had big stores, the court, some tall office bldgs. parking was a hassle, and downtown land was expensive. Today, the stores are gone (to the malls), land is even more expensive, and parking is more of a hassle. I use transit a lot, and think it makes sense to live close to where you work. Most phonicians don’t think that way. The mentality is “single family detatched”. So your house is either 2 or 20 miles from where you work, or shop. You want to get in your car, park close to work or store, then get back in the car and go home. So, you have no reason to go downtown, other than court or a sports game. Pouring money into downtown does make the land more valuable (to the owners). Take our big convention center, who are we trying to compete with; Anaheim, LA, San Francisco, San Diego, Las Vegas, Denver, Houston, Chicago, DC ? I don’t think we’re in the same league as those venues. It seems a lot of public money to sink in just to compete with second tier convention sites. same goes for light rail. It’s great for those that can use it (I do), but all we got was year 1896 technology (dressed up in a 2000 look). For 1.8 billion, that’s 1800 million, we could have got a lot more transit, to serve a lot more people. It’s time to stop importing “experts” from back east (we’ll be living with the federal court house forever), and trying to make our downtown like “back east”. we need to come up with our own version. The first sentence is absolutely correct, but that knowledge doesn’t have to come from a formal degree. It’s largely experiential. The sentence in parentheses therefore strikes me as unneeded credentialism. We’ve already go too many people pushing divisive agendas and making questionable decisions based on claims of expertise, real or imagined. I don’t think Jane Jacobs ever took a single class in urban studies. I disagree that a grocery is more important than density. 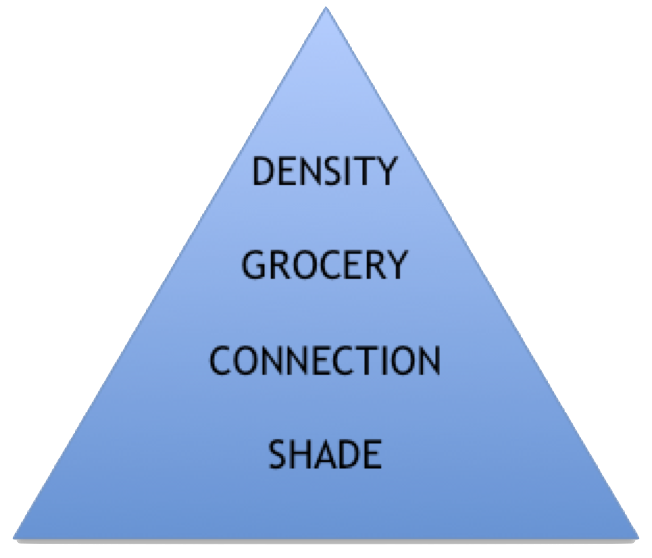 With density, a grocery will naturally follow. If you keep trying to shoehorn more retail into downtown without the residential density to support it, it’ll keep failing. When stores keep failing, Downtowns reputation will continue to erode. Shade should be our #1 priority. We need to become obsessed with shade. Look at old pictures of Phoenix, say pre 1960, it was insanely shady, they weren’t dummies. If UofA’s campus can technically be an Arboretum, why not Downtown Phoenix? Thats a goal we should pursue, it would be a good way for us to encourage shade in a creative way. Phoenix should also find creative ways to fund tree planting programs. How about every time the D’backs hit a HR or the Suns sink a 3 pointer, they donate a tree planting to the City? I’d love to see 1K trees planted per year for the next 10 years in the ‘inner loop’ (I-10/1-17) to help cool the core. All dirt lots should be required at the very least to be planted with grass, but bosques of cheap, non water intensive trees would be best (i.e. Mesquites). I also take issue w/ the 1st reply about “parking is more of a hassle.” Downtown Phoenix is insanely easy to park in. Is it as easy as PV Mall at 2pm on a Tuesday? No–but urban areas aren’t shopping malls. I’ve never searched for more than 5 minutes for easy, affordable parking in Downtown Phoenix. When I lived in Boston there were times I’d search for 30-45 minutes for parking in the more urban zones. Yes, it’s insane that we lay down asphalt, which makes the valley hotter, without adding more cooling shade trees. One way we could almost instantly increase density is to have the cities abolish their minimum parking requirements, which harm the economy by unduly burdening business owners, and replace them with modern parking management technology to permanently prevent parking shortages. Previous Previous post: The Valley’s Bikeability? Next Next post: What’s OUR Apollo moment today?